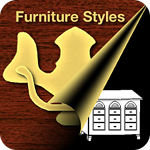 The Furniture Style Guide describes and dates nineteen popular furniture styles and their distinctive components. Click on a style name for detailed information. An English style of furniture, which is medieval in appearance with straight lines, rigid designs, sturdy construction, ornate carvings and a dark finish. Much of the early American furniture was patterned after this style. Rudimentary utilitarian furniture made from local woods. It was brought from or modeled after European furniture styles, particularly from England, France, the Netherlands, Scandinavia and Spain. Named after William and Mary of England (1689-1694). It has Dutch and Chinese influences and is characterized by trumpet turned legs terminating in a ball or Spanish foot, padded or caned chair seats, and Oriental lacquer-work. Named after Queen Anne of England who reigned from 1702-1714. The Queen Anne style is a refinement of the William and Mary style with a moderately proportioned, graceful appearance. It is characterized by cabriole legs terminating in a pad or drake foot, fiddle-back chair back, and bat wing shaped drawer pulls. Combined the furniture style characteristics of William and Mary, Queen Anne, and Chippendale. Colonial furniture tended to be more conservative and less ornate than English and European furniture of the same style period. A simple, utilitarian American country style of furniture with Germanic influences. It is characterized by colorful folk painting on case pieces. Named after British designer and cabinet maker Thomas Chippendale, who published his furniture designs in "The Gentleman and Cabinet Maker's Director" in 1754. The Chippendale style can be classified into three types: French influence, Chinese influence, and Gothic influence. In the United States, the Chippendale style was a more elaborate development of the Queen Anne style with cabriole legs, ball-and-claw foot, and broken pediment scroll top on tall case pieces. Named for architect Robert Adam who studied ancient architecture in Italy. While in England, he designed furniture with classical details that would fit the character of his classically designed homes. The Adam style was limitedly reproduced by cabinetmakers in the United States. Adam interior millwork and woodwork was reproduced in South Carolina. Named after English designer and cabinetmaker George Hepplewhite whose designs in "The Cabinet Maker and Upholsterers Guide" were published posthumously in 1788. The Hepplewhite style is neoclassic and was reproduced in the United States particularly in the Carolinas, Maryland, New England, New York and Virginia. It is characterized by a delicate appearance, tapered legs and the use of contrasting veneers and inlay. Combined the neoclassic furniture style characteristics of Hepplewhite and Sheraton. It is characterized by graceful straight lines, light construction, tapered legs, and the use of inlay, and contrasting veneers. Named for English designer Thomas Sheraton who published his designs in "The Cabinet Makers and Upholsterers Drawing Book" in 1791. It is a neoclassical style characterized by delicate straight lines, light construction, contrasting veneers and neoclassical motifs and ornamentation. The Sheraton style was the most reproduced style in the United States during the Federal period. Named after American cabinetmaker Duncan Phyfe. The Duncan Phyfe style is considered by some art historians as more of an adaptation and refinement of Adam, Sheraton, Hepplewhite, and Empire than a style in itself. It is characterized by carved or reeded legs and neoclassic motifs. Patterned after French Empire with classical influences. It is moderate in proportion with classical ornamentation, coarse carving, and a dark finish. A simple and utilitarian style produced by the religious group, the United Society of Believers, in self-contained communities within the United States. It is characterized by straight tapered legs, woven square chair seats and mushroom shaped wooden knobs. The Arts and Craft is characterized by simple utilitarian design and construction. Arts and Craft style furniture is also referred to as Mission. A naturalistic style characterized by intricately detailed patterns and curving lines. A simple utilitarian design style in natural wood popularized by Danish and Swedish designers.